Welcome to Great Opals! 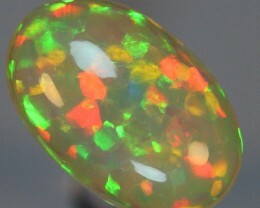 I will be listing some great opals for your consideration. My philosophy is simple: great opals sell themselves. I am here to show you their beauty; guarantee that they are solid, not treated, or manipulated in any way; and to provide a secure environment where you may explore the beautiful and exciting world of opal – the QUEEN of gems. I love opals and I want you to love every opal you purchase from me. My goal is to make you happy. My 7-day money back guarantee gives you time to make sure you are happy with your purchase. If you need to make a return I will happily provide you with a full refund provided the item has not been altered in any way. Please do not return an item without contacting me first. If needed, I will arrange the return for you through my shipping account to ensure there are no problems. Please choose insurance to protect your new purchase from loss or damage during transit. Insurance is at the option of the buyer. If insurance is not chosen then the buyer is responsible for items lost or damaged during transit. This opal has wonderful hexagons on the back and more of a hexagon floral pattern on the front. 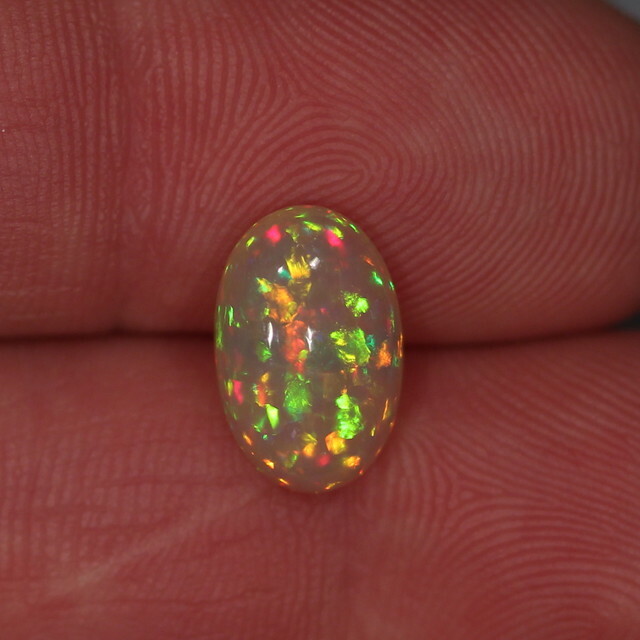 You won't see many opals like this one! Very scarce pattern. It shows great color in all lighting conditions. It sparkles and glistens with nothing but candlelight. 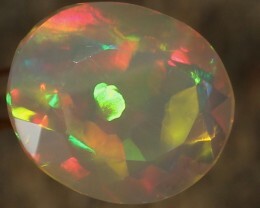 About Inclusions: Many gems, including opals, have slight imperfections. When cutting a gem, the choice is between grinding way precious beautiful material and leaving behind a small imperfection. 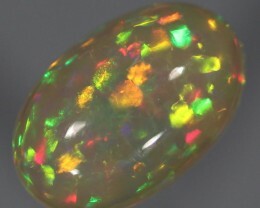 Regarding opals, generally, if the imperfection is very small and you can't see it without magnification (eye clean) then the imperfection has little to no effect on the value of the opal. The degree to which an imperfection depreciates the value of an opal is directly related to how distracting it is. I like to think of it as "The Distraction Test." Simply ask yourself, does this imperfection distract from the beauty of the opal? If so, then you need to depreciate the value of the opal accordingly. 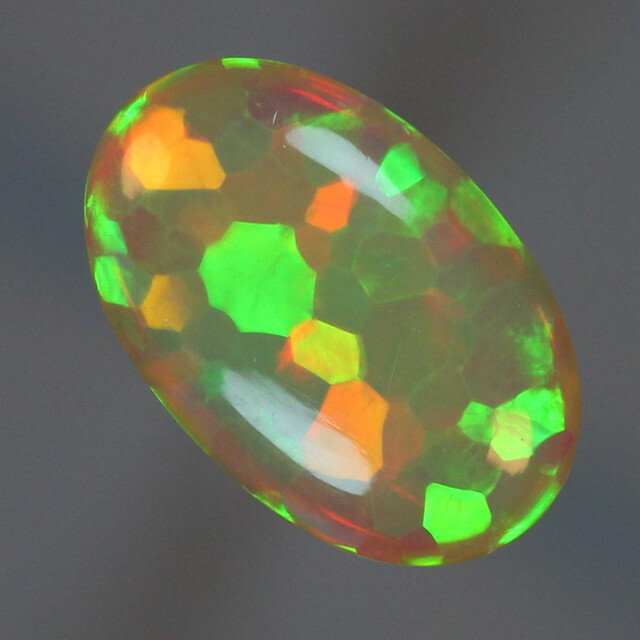 The Distraction test mostly applies to the top of the opal. 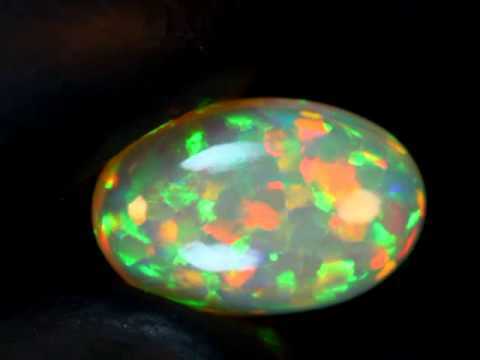 Imperfections on the back of the opal generally do not depreciate the value of the opal unless the imperfection can be seen when looking at the top of the opal or if the imperfection is so large as to affect the stability of the opal. Cracks are the exception. 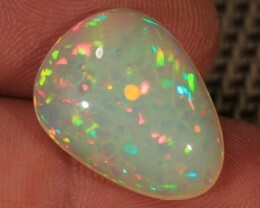 Any opal that is cracked is specimen grade only and is worth perhaps 10% of its non-cracked value. 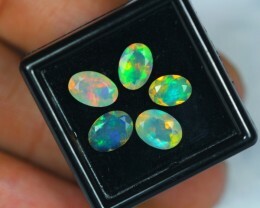 Additional Note: All of my opals are graded at 10x magnification and inspected at much greater magnification. Also, I put all of my opals through a series of stability tests to help ensure that only the best most stable opals make it to market. These two processes combined take a lot of extra time but in the end only the best most stable opals make it to market. If you need something by a specific date then please contact me for more shipping options. Domestic Shipping: Shipping is via USPS with a typical delivery time of one week or less. International Shipping: Shipping is via USPS with a typical delivery time of 2 - 6 weeks. NOTICE: I reserve the right to void and re-list any item that can't be insured. Certain countries and zip codes are non-insureable. If I can't insure it then I can't ship it. By bidding on this item you are agreeing to pay for it within 24 hours of its closing. If you wish to pay with different terms then please contact me before bidding to make arrangements. All non-paid items may be voided and relisted. I want you to have a very good idea of what you are buying before you buy it. I don't do any editing to my images other than cropping to size. The images that you see are accurate to the best of my ability but there is more color and life in the opals than I capture in my images. So, the opals will be better in hand. 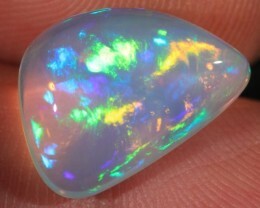 If you are new to opals then you should know that it is impossible to capture the exact nature of an opal in images. 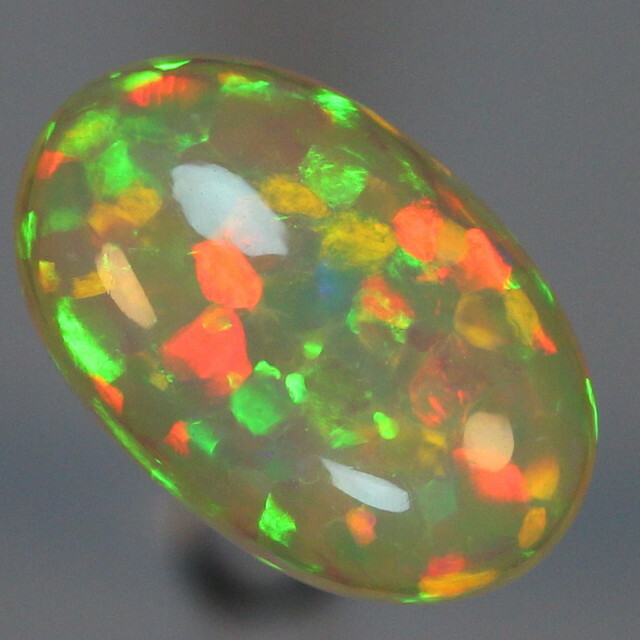 Many opals look different under different lighting conditions. Make sure to look at your opal with the sun at your back and coming over your shoulder. 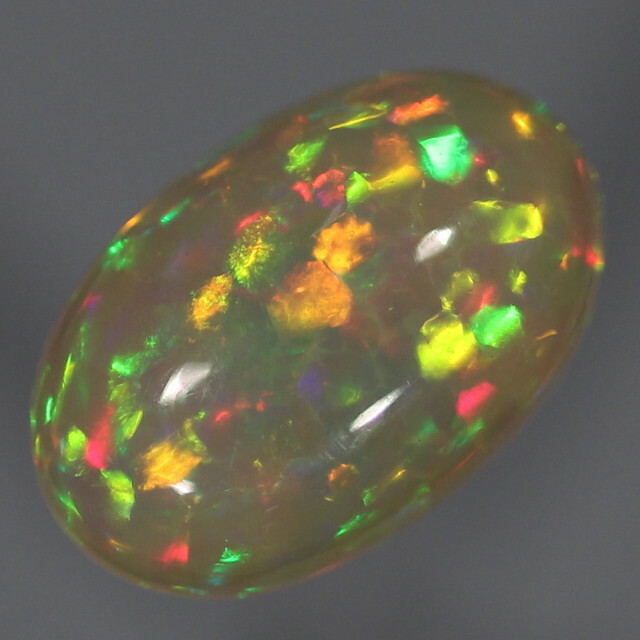 Not all opals look best in full sunlight. Some opals look better with less light and some opals look drastically different on cloudy days or in the morning light . I hope you have fun exploring the wonderful world of opal. A note about my opals: My opals are acquired from the best most direct sources possible. I personally sift and sort through thousands of carats of opals to bring you truly unique hand-selected opals that “stand-out” from the rest. All opals are unique – that is why we love them so much. Uniqueness is matter of degree. 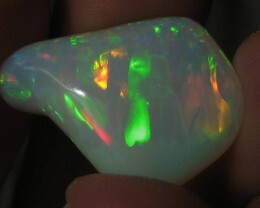 The opals you see here are unique to a very high degree. 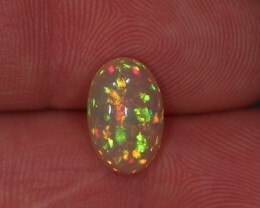 15.76CT EXTRMLY BRIGHT CARVED WELO OPAL INSANE STRIPED FIRE! 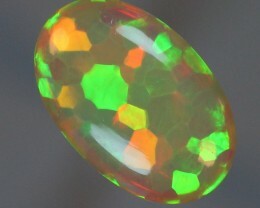 6.76CT EXTREMELY BRIGHT CRYSTAL WELO OPAL WITH 5/5 FIRE!! ポジティブ 2.65ct. Faceted. 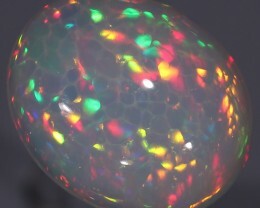 Special Confetti Opal.